Last Sunday, we went with our friends Jen and Gary to see the David Bowie exhibit at the Brooklyn Museum and Jodi was tasked to find a brunch place. Her pick: The Vanderbilt in Prospect Heights, where Chef Saul Bolton of SAUL Restaurant in the Brooklyn Museum, Red Gravy in Brooklyn Heights and Brooklyn Bangers serves an interesting menu in a very relaxed atmosphere. And the food there was phenomenal! In fact, it has been a while I did not have such good brunch and I am talking about brunch in its literal sense, not a meal during brunch time that has nothing to do with what a brunch should be. I started by ordering one of their creative brunch cocktails: the Dew Drop made with Aperol, grapefruit juice and cava. I loved the bitterness of it. Then, I got the beignets. 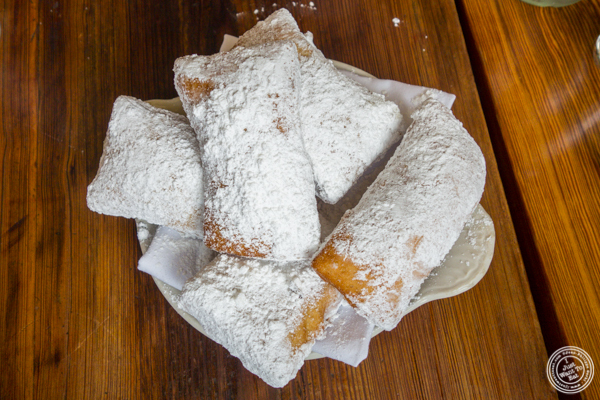 Fried dough is always comforting and these pillowy beignets, smothered in confectioner's sugar that either end up on your clothes or the tip of your nose were superb. Jodi on her side got the breakfast platter, that is composed of eggs any style (she chose scrambled), bacon, a sausage (she or I should say I chose their kielbasa that was very good), hash browns and an English muffin. We left glad we had a little walk to the Museum after such a meal. The Vanderbilt was a nice discovery and I would definitely go back there, maybe even for dinner.